The government of Virginia is in a mess. The allegations become uglier with each passing day. It is an ethically and morally charged issue that dates back decades--and there is the fundamental problem. I think society is getting too sensitive about things that happened 40 years ago! 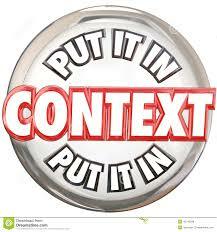 Is it possible that we are losing perspective and taking actions out of context? Are we engaging in what is called: revisionist history? Do not misunderstand me--I am not condoning the activities of the leaders in question, I am just urging that actions be viewed in context with the norms of society at the time. Society changes over time and what is acceptable, likewise, changes. As an example of changing societal context, think about the Bugs Bunny cartoons or the Three Stooges. When I was young, Bugs Bunny was a very violent cartoon. They were funny but were filled with violence and biting, insulting comments which were, at the time, acceptable. Since then, the cartoons have edited for the current generation to remove the violence and the now unacceptable comments. This is an example of how what is societally acceptable changes over time. What was acceptable is not now accepted. It is the same with the Three Stooges--their humor was funny then, but now it is not accepted. In fact, I do not find the Three Stooges funny anymore and do not watch their antics. I have to believe we are forgetting that what is acceptable to society changes over time and as we become enlightened we forget that applying the mores of today to the past confuses the issues. We need to ask ourselves, are the actions by someone in the past outside of the norms for the period of time? Put another way, for the time and the place, was the action egregious? Just a thought. Ultimately, it is for each of us to decide.